As promised, I am rolling out recipes for some of my favorite family meals. This one is a huge hit with my toddler because it has "noodeeze" and turkey meatballs. She isn't so keen on the tomatoes, but I reserve those for my husband and I. Also, the finely chopped greens that end up on the "noodeeze" are a great way to sneak some greens into her picky little mouth. Ramps are only around in the spring and early summer so get 'em while the gettin' is good! Preheat oven to 350 degrees. In a large bowl combine all of the ingredients with your hands. Roll into 1 inch balls and place on a greased baking sheet. Bake for 25 minutes. Put olive oil in pan, heat over medium heat until oil is hot. Add squash and zucchini and brown. Add tomatoes and cook until all the vegetables are tender. Add basil, ramps, garlic and spinach and cook for about 1 to 2 minutes or just until the greens are cooked. In a large bowl, pour the vegetables over the noodles and toss. 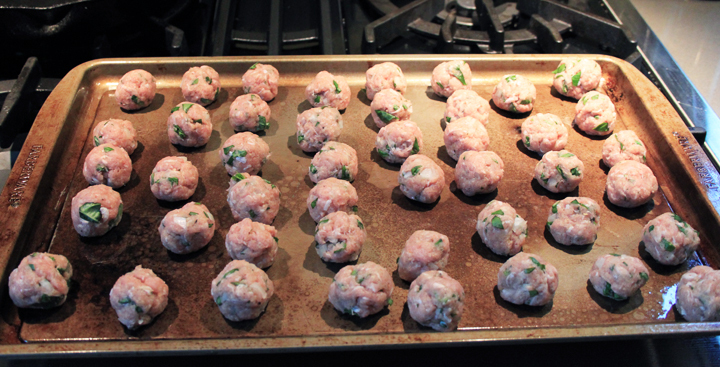 Add the meatballs to the dish and serve.